Triggered by an initial idea from local cyclists, and supported by Stafford Borough Council's Local Agenda 21 Team, Back 2 Bikes opened officially in June 2004. In 2010 the organization had grown to such an extent it became a registered charity in it's own right. 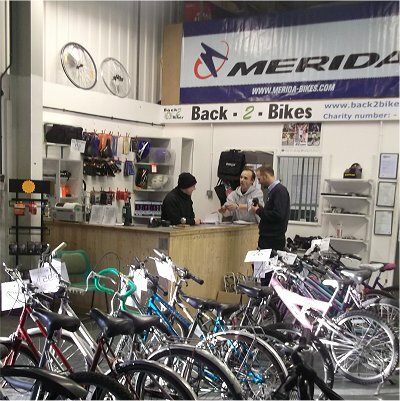 Since its foundation Back 2 Bikes has developed a reputation for not only the sale of affordable, guaranteed pre-owned bicycles and spares but also for quality repairs, servicing and the supply and fitting of a wide range of cycle accessories. However repairing and recycling bicycles is only part of the work at Back 2 Bikes, as these practical activities are purely the vehicle for helping the unemployed gain skills which they can use to help them find paid employment. - The refurbishment and recycling of pre-owned bicycles. - To offer supported volunteer and work placement opportunities. - To help those seeking paid employment gain appropriate skills and experience. - To encourage a healthy lifestyle through the use of affordable bicycles. - To encourage the general public to donate their unwanted bicycles not only to help those who cannot afford to buy new machines, but also to improve the environment by removing scrap materials from the waste stream.